of Chevy trucks. 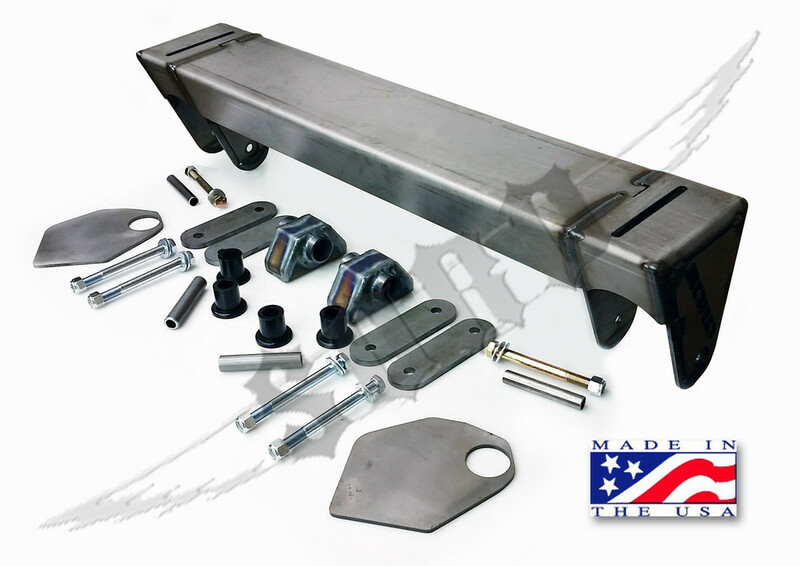 Includes front hanger for the front of the springs, rear under frame shackle hangers for the rear of the front springs, braces for under frame shackle hangers which weld on and cover the old shackle pivot mount hole, heavy duty shackles and hardware. Leaf spring hanger and shackle hangers constructed from laser cut and cnc formed 3/16th and 1/4 inch po steel plate, shackles are 4 inch eye to eye, 5/16ths thick steel laser cut plate. Shackle hangers include poly bushings for extra control and long life. Fits most any vehicle with a 31.5 spring center, can also be used on most 2wd vehicles with a creative installer to solid axle and convert to 4 wd. Kit is designed to use factory Chevy 47 inch front springs, with an over all width of 3 5/8ths-3 3/4 including bushings. If using other springs, you will need to compensate for the width depending on what the difference is, such as using rears up front, which will only be 3 inch over all width. Click the button below to add the 1968-1988 Chevy And GMC 1/2-1 Ton 4x4 Perch Drop to your wish list.